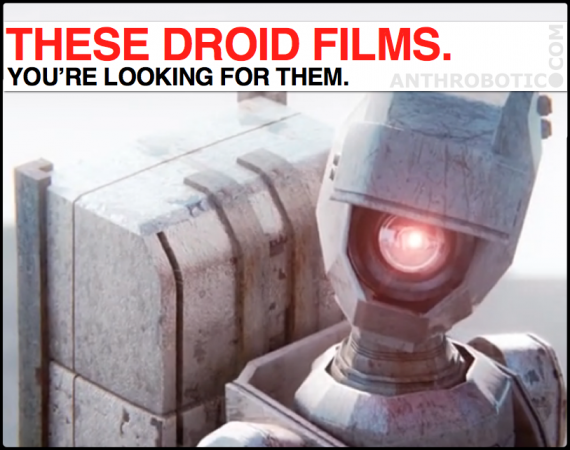 Here they are – the best robot-themed short films of 2013 (up until now, but yeah go ahead – you got something better then prove it, yo!). Now, if you want to know why, jump on over to Akihabara News’ coverage of the details and the answers to other questions beginning with words that begin with “w.” Because that piece was also pounded out by Anthrobotic’s chief WordPress fiddler, so it’s not really like cheating. Technically. Well that was fun, yeah? Again, if you can call b.s. on any of these, or if you’ve got something better, drop your knowledge in the comments below. Or, if you just wanna say “Hey dork, did you know about this one?” – that’s cool, too – even older ones would be welcome. They’ll be added to the ANTHROBOTICvideos YouTube Channel. If fact, yeah – that’s a challenge. Also don’t forget to remember that if you wanna get the full scoop on WHY these robo-movies are 2013′s best so far, jump to Akihabara News: Top 4 Robot-Themed Short Films of 2013 (thus far), and there you’ll appreciate a milder version of the Technosnark©®™ found here. It’s still fairly smartastic, so Anthrobotic’s 7-8 regular readers will probably dig it. Great work Reno, finding these is always helpful especially having it one place.